Chad Hawkins - The world's largest collection of exclusively temple related products! DailyLDS.com - DailyLDS features a daily deal on the best products & services. Save up to 90%. 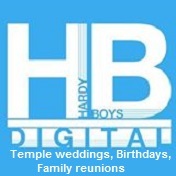 Hardy Boys Digital - Remember your family events the right way: Weddings, Birthdays, Family Reunions, etc. LDS Bookstore - Books, art, rings, necklaces, modest clothing, scriptures, and more. LDS Gift Shop - Church-themed designs and slogans on shirts and gift items. The Mormon Gift Shop - Designs with CTR and much more on T's, outerwear, notepads, clocks, etc. Templeposter.com - This stunning 24� by 36� full-color poster features all the Temples of the World. White Folding Temple Fans - All white folding fans (Nylon fabric) PERFECT for use in the Temple. CTR Ring Shop - CTR rings. Discount prices, free shipping, and a huge variety. ShopRingmasters - CTR Rings, jewelry, scripture cases, temple crystal cubes, ties, tie pins and more. Tungsten CTR Rings - Tungsten CTR Rings are a noble way to show and share your faith with others. Deals to Meals - A grocery and meal planning service for residents of Utah. Know when and where to get best deals. Hometown Seeds - Specializes in high quality garden and survival seeds. Preparewise - High quality food storage and outdor meals for people and their pets. Thrive Life - Great discounts on food storage, shelving, and emergency supplies by Shelf Reliance. Let me help you get started! Valley Food Storage - The best food storage company in Utah! Best ingredients and best prices! By Jakobine - Source for modest anti-wrinkle and washable, missionary skirts, church skirts, or travel skirts. Cleo Madison - Shop our selection of modest dresses, skirts, shirts and more. All U.S. orders ship free! Designs in White - Providing quality white apparel for your sacred occasion. Affordable prices, Molly Modest Boutique apparel. Junee - Online clothing store featuring modest but stylish clothes for women! Kingdom and State - A modest clothing company, offering great women's basics including modest cap sleeve tees, camis, slips, maternity and much more. Kosher Casual - Modest Clothing for the Modern Lifestyle. LDS Blessing Dresses - Source for blessing dresses and boys blessing outfits and other formal clothing for children. LDS Blessing Dresses and Suits - Shop for baby blessing gowns, outfits and accessories. LDSFormalwear.com - A place to buy and sell modest formal dresses. Modest - Dedicated lines of clothing specifically to be worn within the Church modesty guidelines. ModestPop - Like the Forever21 of modest clothing. We scour the market for the best deals in quality modest fashion and bring them to you at a great price. Use MOTHERATHEART for a 10% discount!! My Amazing Wedding Dress - Specializes in custom designed wedding dresses, dress replications, and beautiful modest bridal gowns. My Princess Prom - A modest prom dress rental business servicing the central Utah area. Omika - An Australian online store featuring modest dresses and layering tops for girls and women. Sew Original - Dedicated to providing custom made Bridal Gowns, Temple Dresses, Costumes and More! Simply Elegant - Modest bridal and formal gowns. Heritage Makers - Independent Director helps you professionally print and bind your family history, memories, scrap books, greeting cards and more! Pirografia.artelista.com - Pyrography designs of Book of Mormon and Bible characters on leather scripture covers. ScrapbyColor with Holley - Digital scrapbook freebies and products. LDSMissionaryCards.com - Order personalized Missionary Cards. LDS Mission Plaques by Mad River Laser - Missionary plaque superstore that utilizes state-of-the-art laser engraving. Melly Mormon's Gift Shop - Great Stuff for FAMILIES & their MISSIONARIES! Missionary Mailbag - The best way to save and share your mission experiences with friends and family. MyMissionaryGifts.com - Missionary Gift Packages featuring yummy treats and fun, motivational and useful items for missionaries. Personal Ponderings - The Scripture Journal. A journal for missionaries to record and organize personal spiritual writings on various gospel subjects. Sis-Miss - Cute and unique Sister Missionary Clothing. Ugottapackage.com - Amazing monthly packages for missionaries that everyone can afford! Designed for missionaries by missionaries. Heritage Makers - Make your own hardbound books easily online! OneGreatFamily.com - Connect with other people who have already found your ancestors! Esplin Fine Prints - Offering incredible Temple Drawing prints for all occasions. Frame The Alphabet - Personalize a family name or meaningful word using letters of the alphabet, seen from a different perspective. Gewalyart.com - Original Temple prints in the stipple style, using black ink. Inspire Graphics - Fonts and clip art for ward bulletins, programs, invitations, etc. Kendall Davenport - Temples and landscape scenes painted with an exciting new art form. LDS Clipart Index - Clipart for Primary, Scripture characters, etc. LDS Temple Store - The world's largest collection of exclusively temple related products! Mormon Share Arts - Free Clipart and lesson handouts. Prophet Paintings - Artwork and other inspirational art for your home or chapel hallway. RexPriceArt.com - Inspirational art by lds artist Rex Price. Windmill Designs - Unique and original counted cross stitch patterns. Lara Johnson - Recordings of vocalist Lara Johnson in English, Spanish, and Russian - "Songs of Everlastying Joy"
LDSMusic.us - Sheet music, PDF files, and MP3 recordings. The PianoGuys.com - A popular music duo performing renditions and mashes of popular songs on piano and cello. Wayneburton.com - Songs featured on EFY albums and heard on various radio stations. Wayne Burton's music will lift and inspire you! Mommy Bear Media - We carefully examine all movies and TV shows and only sell family-approved ones. Choose the Right Nanny - A Church based nanny referral site. LDSBid.com - The auction site to buy and sell books and other goods and services. LDSHelp4Hire.com - Connecting People Who Share Family Values: Babysitters, Nannies, Pet Sitters, Genealogists, Housekeepers, Preparedness Specialists, Tutors, Senior Care, Special Needs and Helping Hands. Member Agents - Free Realtor search. Find a professional, dedicated agent to assist with your next real estate sale or purchase. TempleShuttle.org - We provide free shuttle service between the DC Temple and the Metro and will be expanding to other temples. The Enlightened Homemaker - Free newsletter for homemakers, resource reviews, recipes, book club membership, etc.